A team of researchers have stared a new project that will give us a look at how Scone, one of Scotland’s medieval royal centres, looked like and why it was so important to the development of the Scottish kingdom. The University of Stirling and working in co-operation with Scone Palace, is hosting a free public event in Perth on Sunday 30 March – to reveal what Scone was like in medieval times and develop awareness of Scone’s cultural, historic and symbolic significance. For six centuries, Scone was the symbolic epicentre of the Scottish state. It was where Scotland’s kings were traditionally crowned and the political community gathered to legislate and to advise their monarch. 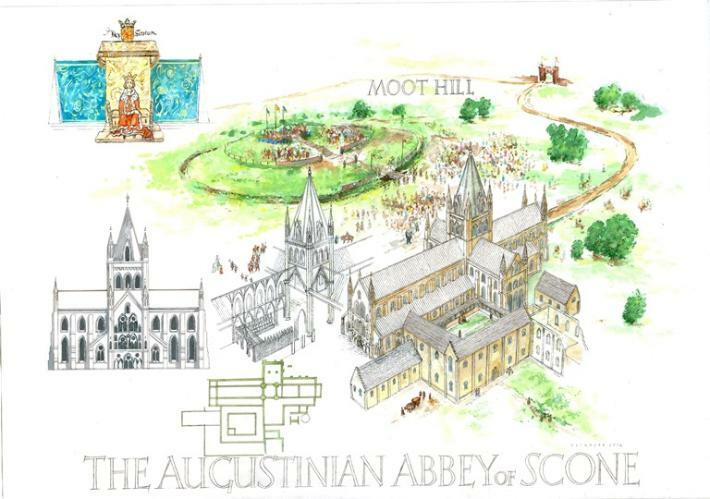 However, during the Reformation the Abbey of Scone was destroyed by a mob. When the Scottish crown was passed to the Kings of England in the early modern era, the political importance of Scone rapidly decline. Even the medieval village of Scone was abandoned in the early 19th century. Professor Richard Oram, project leader and Professor of Environmental and Medieval History at the University of Stirling said: “Despite Scone’s importance in Scottish identity and Scotland’s history, there is currently limited understanding of the site, the function of its components, and the nature of the activities undertaken there. “Our new project, entitled ‘Royal Scone: parliament, inauguration and national symbol’, will assemble a network of researchers in archaeology, architectural history, legal and political history – including representatives from Historic Scotland – to develop a wider and more accurate picture of what royal Scone was like. Members of the public are invited to drop in to the event to participate in a range of interactive talks and demonstrations. Highlights include a session by Dr Oliver O’Grady, from the University of Glasgow’s Centre for Open Studies – on new findings from the archaeological investigations at Scone; a demonstration by Dr Alan Miller from the University of St Andrews – to show how 3D digital technology can be used to recreate ancient sites like Scone; and an exhibition by artist James Lindsay, whose illustrated reconstructions of Scone Abbey and Moothill reveal what life was like in the medieval period. The project researchers – who are currently exploring the case for making a UNESCO World Heritage site application for Scone – hope the event in Perth will also raise awareness about the importance of the future safeguarding and development of all European royal medieval heritage sites. The event is the first of series of public activities and academic panels to be held throughout 2014, which will culminate in an international conference held in December. The findings of the conference will be published in a new authoritative account of Scone’s history as a primary royal centre and its relation to wider European sites of governance.